Have egg whites? Make pavlova! Or better still, for something a little fancier, make a pavlova roulade! This dreamy dessert of soft, white, fluffy meringue rolled up and filled with fresh strawberries and mascarpone cream is sure to impress, and making it is easier than it looks! If you have tried making swiss rolls before, well, this is way easier than that. Firstly, you just need to beat the egg whites with sugar until thick and glossy. No folding of flour and what-nots are necessary here. Secondly, rolling up the meringue is relatively easier than trying to roll up a sponge cake as the meringue has a marshmallowy texture which is less likely to crack or break into pieces. This also enables it to "mould" easily to form a log shape. This is truly one of my favourite desserts. The meringue is so soft it melts in your mouth together with the sweet mascarpone cream and the tart and juicy strawberries. And the almond flakes scattered over the crisp and lightly tanned crust on the meringue gives it a lovely crunch. Addictive! I added just a tiny, tiny hint of rosewater essence in the meringue, as I find that too much can overpower the delicate flavour of the roulade. Please find the recipe below after the jump. Preheat oven to 180C. Grease a 23cm x 33cm swiss roll tin and line with baking paper, letting the edges hang over the sides (about 3 inches wide) as the meringue will rise pretty high in the oven. Place the egg whites in the bowl of an electric mixer and whisk on high speed until stiff peaks start to form. Fold in the rosewater essence, cornflour and vinegar. Turn the mixer on medium speed and gradually add the sugar. Whisk on high speed for about 5 minutes until the meringue is thick, glossy and stiff. Use a spatula and spoon the meringue into the lined tin, and level the surface with a palette knife. Sprinkle evenly with almond nibs/flakes. Bake in the oven for about 20 minutes (on the middle rack) until the almonds and the surface of the meringue is lightly browned. Remove and cool in the tin for 5 minutes. Then turn it over onto a clean piece of baking paper and peel the paper off the base. Let it cool completely on a wire rack. Make the filling by whisking the cream until soft peaks form. Whisk in the sugar. Then add the mascarpone and beat lightly until just combined. Assembling: Spread the filling over the meringue (with the almond side down). Sprinkle with strawberry pieces, gently pressing them into the cream. 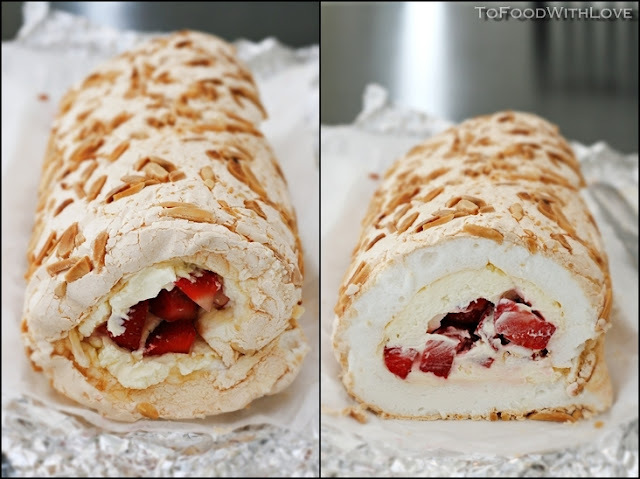 Then, using the baking paper as a guide, roll up the meringue to form a log enclosing the cream and strawberries. Roll up again in a large sheet of aluminium foil and twist the ends tightly. Refrigerate for 2-4 hours before serving and use a serrated knife to cut the roulade into 1 inch slices.